The previous lesson dealt with the Gospel of John's discussion on the baptism of Jesus. This week, we look at what the Synoptic Gospels (Matthew, Mark and Luke are related gospels) say on the matter. Where Did John Come From? John the Baptist's background is important here. Luke 1 gives us a divine beginning to the Baptist, his birth proclaimed by the archangel Gabriel. During his infancy, his father was killed by King Herod, who was searching out all male children to slay. Elizabeth took John into hiding in the wilderness. Some scholars believe that John was taken to the Qumran area, where the Dead Sea Scrolls were discovered, and dwelt with the exiled priests in the desert. There are many similarities between John's teaching and those of the Essenes who lived at Qumran. Here Charlesworth comments on the connections with Isaiah 40:3. 3. They both used water as a means of expiation. 4. Both were eschatological (focused on death, judgement and the end of the world). hatred of all who were not within the community.” (John the Baptist and the Qumran Connection, Alan Taylor Farnes). Many scholars believe John the Baptist began his training among the priests of the Qumran Community. At some point, he left the community, because his calling was to go forth among the people and call repentance. The Essenes viewed themselves as those "crying in the wilderness" (Isa 40:3) as a witness against the evils they believed going on in Jerusalem and the temple. However, John the Baptist understood he was the one called to prepare the way for the Messiah. What Other Jewish Groups Were There? The Essenes, according to the Dead Sea Scrolls, were once in control of the temple and the religion of the nation. During the period of the Maccabee rulers, the priesthood authority was wrenched from them and given to other priests. The Essenes fled to Qumran, next to the Dead Sea, and began a cloistered community. There also were other Essenes who were not celibate, who married and dwelt in the villages of Judah, who followed a somewhat different set of standards and expectations. They did not baptize as we do today, but did immerse themselves frequently in water for purification. As a group, they ate a common meal and drink each day, expecting to one day partake of these sacraments with the coming Messiah. The Pharisees were perhaps the largest group of Jews in Judah. While they did not have many priests in their group, they did control and teach in most of the synagogues. This gave them great influence over most of the people, as they taught the average Jew the gospel from their perspective. They included oral traditions that were external to the Biblical writings, attempting to build a wall of protection around the writings of Moses and the Prophets, with the writings of Rabbis and others. Their rules often greatly expanded those given by Moses, including rules prohibiting certain knots being tied on the Sabbath day, or walking more than a certain distance on the Sabbath. After the destruction of Israel in 70 AD (and again in 135 AD with the Bar Kokhba revolt), rabbinic Judaism would rise from the ashes of the Pharisee cult, and is what Jews base their current religion on 2000 years later. The Sadducees included priests and aristocrats that controlled the temple and the sacrifice. These did not believe in resurrection. They strictly followed the Bible, without any external interpretations. Zealots were groups of Jews seeking a temporal Messiah that would rescue Israel from its external enemies (Rome, etc). Among them were many proclaimed Messiahs, including Barabbas (literally "Son of Father"), who was arrested and sentenced to die by the Romans for insurrection. The Herodians were a small group that supported King Herod as King of Judah. Sometimes this would include individuals or groups from the other sects, who connected themselves with the ruling party. The Baptist Movement - even John the Baptist had disciples who followed him until his death. On a few occasions, John attempted to have his disciples follow Jesus, not always succeeding in doing so. It was necessary for John the Baptist to be a Levite and a descendant of Aaron. In having this lineage, he had authority to baptize. The Pharisees and Sadducees who questioned him did not ask where his authority came from, but why he was baptizing. They knew what baptism was, and that various sects performed washings in slightly different manners. For John, the evolution from the Essene purification washings to a baptism for the remission of sins, was a simple step. It drew crowds, because Essenes were not known to proselytize. They were used to self-proclaimed Messiahs to suddenly appear and them flame out as Roman guards would execute them. However, they had never seen someone come forth crying repentance, stating that someone else would soon come forth as Messiah! 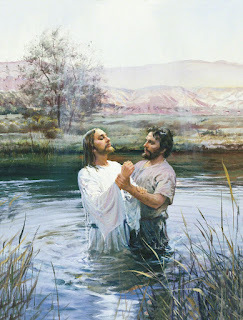 John explained that through his priesthood, he could baptize with water for remission of sins. However, the Messiah would come forth with a greater power, a priesthood that would call down the Holy Spirit and Fire upon the recipients of Messianic blessings. As Aaron was a type for Christ, so is John the Baptist. John, being the descendant of Aaron, held the rights to serve in the temple, offering animal sacrifices and serving in the Holy of Holies. As Aaron's service in the temple prepared for the great sacrifice of Jesus Christ, John's baptism would prepare the way for Jesus' baptism of fire and Spirit.